After painting a mixed picture of the Arab and non-Arab Muslim world, Yinon concludes: «This national ethnic minority picture extending from Morocco to India and from Somalia to Turkey points to the absence of stability and a rapid degeneration in the entire region. When this picture is added to the economic one, we see how the entire region is built like a house of cards, unable to withstand its severe problems». At this point, Yinon even describes new «opportunities for transforming the situation» that Israel must do in the coming decade. With regard to the Sinai Peninsula, this involves re-establishing control over Sinai as a strategic, economic and energy reserve for the long run. «Egypt, in its present domestic political picture, is already a corpse, all the more so if we take into account the growing Moslem-Christian rift. 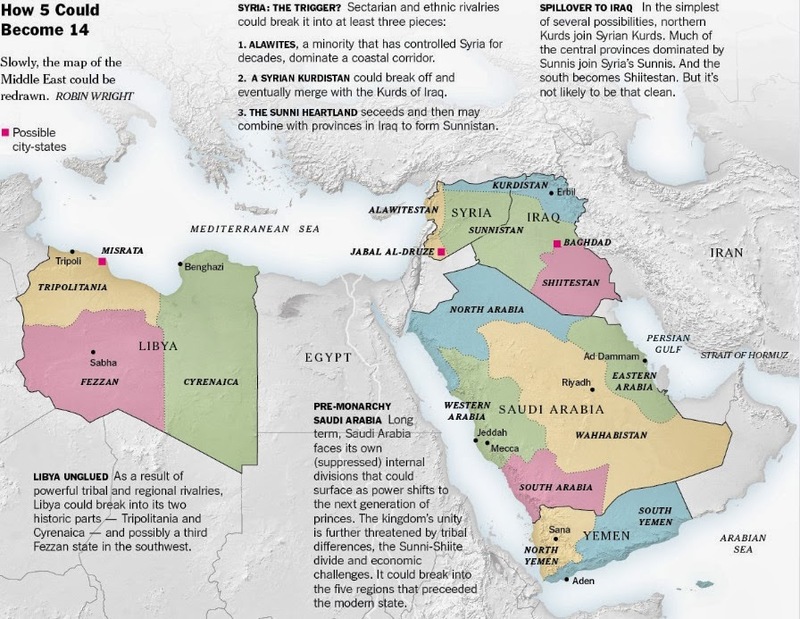 Breaking Egypt down territorially into distinct geographical regions is the political aim of Israel in the Nineteen Eighties on its Western front». With regard to Israel’s Eastern front, which is more complicated than the Western front, Yinon writes: «Lebanon’s total dissolution into five provinces serves as a precedent for the entire Arab world including Egypt, Syria, Iraq and the Arabian peninsula and is already following that track. The dissolution of Syria and Iraq later on into ethnically or religiously unique areas such as in Lebanon, is Israel’s primary target on the Eastern front in the long run, while the dissolution of the military power of those states serves as the primary short term target. Syria will fall apart, in accordance with its ethnic and religious structure, into several states such as in present day Lebanon, so that there will be a Shi’ite Alawi state along its coast, a Sunni state in the Aleppo area, another Sunni state in Damascus hostile to its northern neighbour, and the Druzes who will set up a state, maybe even in our Golan, and certainly in the Hauran and in northern Jordan». «Iraq, rich in oil on the one hand and internally torn on the other, is guaranteed as a candidate for Israel’s targets. Its dissolution is even more important for us than that of Syria... Every kind of inter-Arab confrontation will assist us in the short run and will shorten the way to the more important aim of breaking up Iraq into denominations as in Syria and in Lebanon. In Iraq, a division into provinces along ethnic/religious lines as in Syria during Ottoman times is possible. So, three (or more) states will exist around the three major cities: Basra, Baghdad and Mosul, and Shi’ite areas in the south will separate from the Sunni and Kurdish north». «The entire Arabian peninsula is a natural candidate for dissolution due to internal and external pressures, and the matter is inevitable especially in Saudi Arabia, regardless of whether its economic might based on oil remains intact or whether it is diminished in the long run. The internal rifts and breakdowns are a clear and natural development in light of the present political structure. «Jordan constitutes an immediate strategic target in the short run but not in the long run, for it does not constitute a real threat in the long run after its dissolution, the termination of the lengthy rule of King Hussein and the transfer of power to the Palestinians in the short run. There is no chance that Jordan will continue to exist in its present structure for a long time, and Israel’s policy, both in war and in peace, ought to be directed at the liquidation of Jordan under the present regime and the transfer of power to the Palestinian majority. Changing the regime east of the river will also cause the termination of the problem of the territories densely populated with Arabs west of the Jordan... Genuine coexistence and peace will reign over the land only when the Arabs understand that without Jewish rule between the Jordan and the sea they will have neither existence nor security. A nation of their own and security will be theirs only in Jordan». Further on, Yinon sets forth Israel’s internal strategic objectives and the ways to achieve them, emphasising the need for serious changes in the world. «Dispersal of the population is therefore a domestic strategic aim of the highest order; otherwise, we shall cease to exist within any borders. Judea, Samaria and the Galilee are our sole guarantee for national existence... Realising our aims on the Eastern front depends first on the realisation of this internal strategic objective. The transformation of the political and economic structure, so as to enable the realisation of these strategic aims, is the key to achieving the entire change. We need to change from a centralised economy in which the government is extensively involved, to an open and free market as well as to switch from depending upon the US taxpayer to developing, with our own hands, of a genuine productive economic infrastructure. If we are not able to make this change freely and voluntarily, we shall be forced into it by world developments, especially in the areas of economics, energy, and politics, and by our own growing isolation». «Rapid changes in the world will also bring about a change in the condition of world Jewry to which Israel will become not only a last resort but the only existential option». Evaluating the plan, it is possible to draw the following conclusions. Firstly, since it outlines Israel’s strategic objectives, it is designed for the long term and is particularly relevant today. Secondly, the possibility of realising the external strategy described involves serious changes both to the position of Israel itself and on a global scale. Which is exactly what started to happen in the mid-1980s. With the transition of the global ruling class to a neo-liberal strategy, Israel experienced profound changes resulting in the country ending up under the control of 18 of the richest families. Israeli capital was actively invested abroad, while the Israeli market, in turn, proved to be wide open to foreign capital. As a result of the country’s active «integration» in the global economic system, Israeli capital has become so entwined with transnational capital that the notion of a «national economy of Israel» has lost all meaning. In these conditions, Israel’s transition to active expansion even proved possible, although this manifested itself in intellectual and economic influence and infiltration, rather than military control and a forceful presence. The most important thing is the involvement of the territory in general, at the centre of which is Israel. Shmulevich also referred to this when he pointed out that a fundamental concept of Judaism is «to be the force that guides human civilisation and sets the standards for human civilisation». An example of such an Arab-Israeli union, for instance, is the creation of the investment fund Markets Credit Opportunity (EMCO) with 1 billion dollars from the Swiss banking group Credit Suisse AG and the involvement of three of the bank’s largest shareholders – Israel’s IDB Group, Qatar’s state investment fund Qatar Investment Authority, and Saudi private investment company Olayan Group. Even more revealing is the fact that Saudi Arabia entrusted G4S, Israel’s oldest security company, with ensuring the security of pilgrims during their pilgrimage to Mecca (security perimeters – from the airport in Dubai to the Emirates and the Jeddah area). A Saudi branch of the company has secretly been in operation since 2010 and is able to collect personal information not just about pilgrims, but about passengers flying through Dubai as well. As far as the planned «chaos in the Muslim world» is concerned, Israel is carrying this out by proxy, operating exclusively through intelligence agencies while maintaining the myth that it is «a victim of Islamism». On that score, Israel Shahak’s explanation as to why the publication of Israel’s strategic plan does not present any particular risk for Israel is still relevant. Pointing out that this danger could only come from the Arab world and the US, he stressed: «The Arab World has shown itself so far quite incapable of a detailed and rational analysis of Israeli-Jewish society... In such a situation, even those who are shouting about the dangers of Israeli expansionism (which are real enough) are doing this not because of factual and detailed knowledge, but because of belief in myth... The Israeli specialists assume that, on the whole, the Arabs will pay no attention to their serious discussions of the future». There is a similar situation in America, where all the information about Israel comes from the liberal pro-Israeli press. From this, Shahak comes to the following conclusion: «So long, therefore, as the situation exists in which Israel is really a «closed society» to the rest of the world, because the world wants to close its eyes, the publication and even the beginning of the realisation of such a plan is realistic and feasible».